Joseph Beuys | Ich bin ein Sender. Ich strahle aus! | I am a sender. I transmit! A towering creative figure, whose work remains the subject of intense, often heated debate, the impact of Joseph Beuys on the art world of the past fifty years would be difficult to overstate. Beuys was born in Krefeld in the German Rhineland in 1921, but was raised in the nearby town of Kleve, a short distance from the Dutch border. During the Second World War he trained as a radio operator in fighter planes.1 After being shot down in Crimea in 1944, he suffered major injuries, which would impact his health for the remainder of his life. 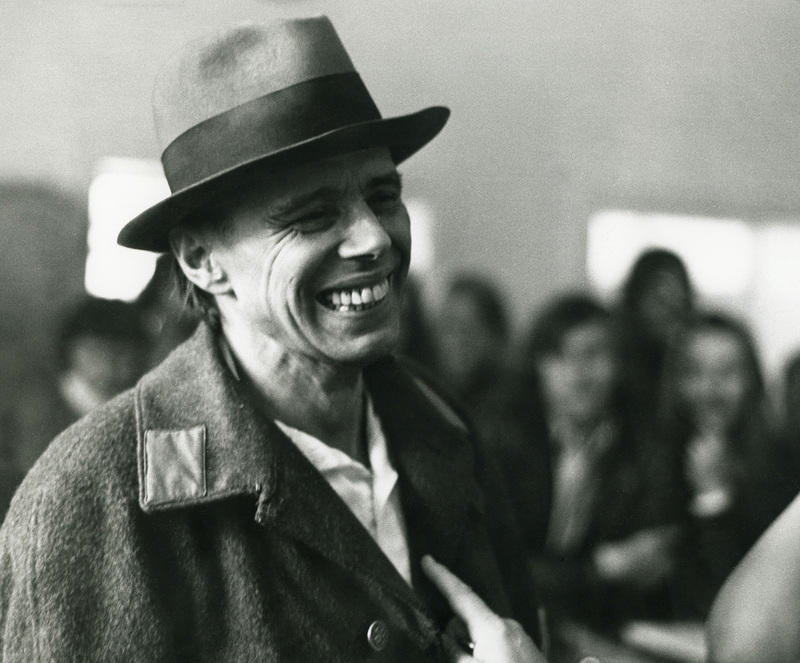 Following the war, Beuys took his first concrete steps toward becoming an artist. Enrolling at the Düsseldorf State Art Academy, from 1947–1953 he studied with the sculptor Ewald Mataré, a prominent German artist, well-known for his animal figures and religious commissions. Working in an elegantly streamlined graphic style, in which a process of formal reduction evoked a sense of drawing nearer to the essence of his subjects, Mataré attempted in his art to move beyond appearances and connect with reality’s hidden core. This transcendental outlook resonated deeply with Beuys, whose drawings and sculptures of this period were initially indebted strongly to Mataré’s work. 2 As time progressed, however, Beuys drew away from his teacher’s influence. Formally, his art became more complex, developing the rougher, more off-hand and erratic qualities that would mark his mature aesthetic. Thematically, it was increasingly marked by oblique symbolic references and mythological allusions. In 1961, Beuys succeeded Sepp Mages as Professor of Monumental Sculpture at the Düsseldorf Academy and in the decade that followed would rise rapidly to prominence in the German art world. Encouraged by the emergence of the Fluxus movement, Beuys entered the arena of performance art, creating enigmatic, ritualistic ‘Kunstaktionen’ [art actions] in which he manipulated props that he had fashioned from a range of unorthodox materials, including copper, fat, felt and honey. Investing these materials and his own actions with a complex symbolism, whose meanings, he contended, were impervious to rational thought, Beuys attempted to engage his audience through intuitive channels of communication.7 As the decade progressed, both his Kunstaktionen and the sculptures and drawings he produced alongside them, would win Beuys considerable renown. From the outset, however, he was a polarising figure. While his supporters were drawn to the rawness and allusive richness of his material aesthetics, his detractors often branded him a charlatan, who trafficked in obscure and irrational mysticism. For his part, Beuys likened his role to that of a shaman, attempting by means of his artistic activities to exercise a healing role within society.8 His engagement with multiples at this time formed part of this initiative. Fanning out into collections throughout Germany and the wider world, they served as vehicles for carrying his art, and the experiences it sought to communicate, beyond the confines of museums, galleries and elite private collections into the homes and everyday lives of a broader audience. Beginning In the early 1970s, Beuys’s art grew more expressly political. Seeking in the spirit of his multiples to extend the social reach of his practice, he began developing an ‘expanded concept of art’. Embracing the creative potential of public activities, such as lecturing, teaching and political discussion, he began conceiving of society as a ‘social sculpture,’ shaped by the collective efforts of its members. Equating art with all forms of human creativity, Beuys sought to harness the creative capabilities of every individual. In pursuit of this goal, he played a founding role in several organisations, including a university, an agricultural alliance and a political party. Prominent among his numerous political projects was an effort to democratise higher education, in which connection he opened his class in Düsseldorf to all who wished to join it. As a result, he was dismissed from the Academy, a decision that was overturned at trial six years later. In the wake of his dismissal Beuys travelled widely, visiting the United States, Australia, Japan, Italy and many other countries to promote his artistic ideas. He continued to work relentlessly in this capacity until the mid-1980s, when his gradually failing health obliged him to slow the pace of this routine. At his death in 1986, Beuys had long since become a leading artist of his era, admired deeply as a sculptor and a draftsman and respected for his efforts to enhance the social role of art. With several of his students already recognised as leading international artists, his stature as a teacher had been confirmed, and in the years that followed, his legacy would continue to grow, above all in the domain of social sculpture. Though much-resisted during Beuys’s lifetime, his notion that an artwork might arise as the product of social interaction would be embraced by many younger artists, who throughout the 1990s and 2000s would use it to reshape the landscape of contemporary art. By virtue of this steadily expanding influence, Beuys’s shadow has become inescapable and his position as a watershed figure within the history of recent art has been cemented.